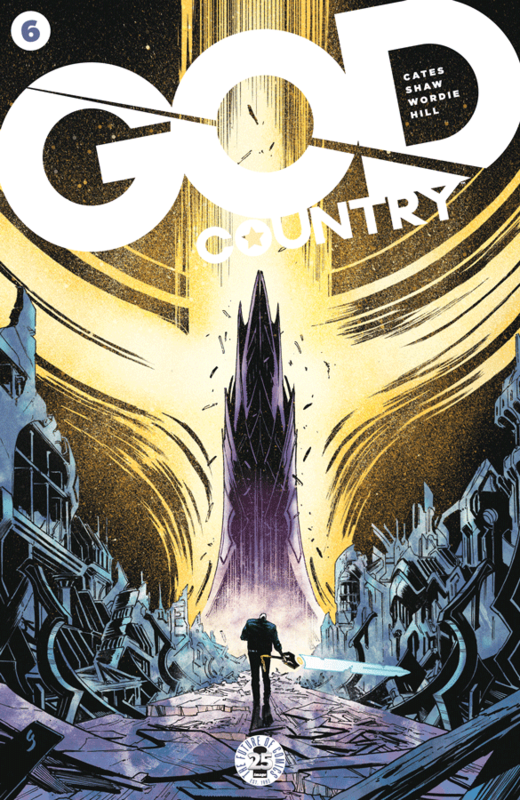 Image Comics' 'God Country' by Donny Cates, Geoff Shaw, Jason Wordie, and Dee Cunniffe has been an unconventional fantasy epic built on heart over might, words overs fists, and family above all. It's hard to believe that it comes to an end with this issue, the limited series closing out in a manner befitting the tone and scope of the last five issues. I don't want to short-change this issue because there is a huge battle in the end (shouldn't come as a surprise). Emmett Quinlan enters the Kingdom of Always to face Attum, god of kings, once and for all. It is crumbling around him yet desires nothing more than to have Valofax, the god of blades, back at his disposal to rule the universe with an iron hand. It's at near Gollum-level thirst and not even his son Aristus, the god of war whom he barred from returning home, can change his mind. All Emmett wants is to remember his family and that can only happen with Valofax in hand. The contrast between the god and the magical sword-wielding mortal is immense. Meanwhile, back on earth, for a god of war with a maniac father Aristus seems surprisingly empathetic and reassuring to the young Deena Quinlan. A character like that would have every right to be angry, cynical, and petulant. Instead, he's the reluctant enforcer, the level-headed and optimistic son. It's one of the ways Cates upends expectations and delivers a much more layered and thoughtful story. This is never more clear than during the big epic showdown between Emmett and Attum. The Kingdom of Always is deteriorating, collapsing around Attum, and his only focus is that sword in Emmett's hand. For Emmett, retaining that sword keeps his mind right, fully engaged with his thoughts and memories. The Alzheimer's that has stolen his past and threatens his present and future is gone and can finally enjoy his time with his son Roy and his family. For Attum, the only thing that matters is the power that sword represents and nothing is going to stop him from getting it. There are clear distinctions between these combatants. One wants to hold on to his memories and the legacy he leaves behind and the other is only interested in himself and the here and now. It's a confrontation that goes beyond trading blows but trading ideologies. And thanks to Cates' dialogue, the words are even sharper than Valofax's blade. The battle is beautifully illustrated by Shaw and Wordie. There are the stillness and breadth of Texas with Roy and his family and the chaotic universe shattering of the Kingdom of Always. The best way I can think of complimenting their work is to say Jack Kirby would be proud. It has a powerful grandeur full of colorful shock waves and windborne facial closeups. And as good as the art is, the contrasting philosophies of Emmett and Attum are what hit home the most. 'God Country' is a lot of things, some you expect, some you don't. It's very much an epic fantasy tale but that's just the gateway to the heart of the story - family. To what lengths would one go to, to hold on to a lifetime of memories, of those you loved? For Emmett Quinlan, not even all-powerful gods will stand in his way. 'God Country' is a limited series of great depth and complexity. In the end, it's about the power of love, family, and legacy. It's also one of the best comics of the year.